You can read about all other types of electrical bushings in Electrical Bushings – Types, Purpose, and Construction. A transformer bushing is one electrical bushing that enables one or several conductors to pass through the grounded transformer tank and insulates the conductor from it. Bushings are a very vital component of transformers. Based on CIGRE WG-12 Report-1983, Bushings (14%) are the 3rd major source of transformer failure after On Load Tap Changer (40%) & Winding (35%). This article focuses mainly on the main two transformer bushing types namely Oil impregnated Bushing and Resin impregnated Bushings and their comparison. The traditional Oil Impregnated Paper (OIP) bushing technology as a transformer bushing types uses oil as its basic insulating medium. Use of oil has many severe drawbacks in bushing life, such as being susceptible to moisture ingress and oil leakage due to worn out seals. 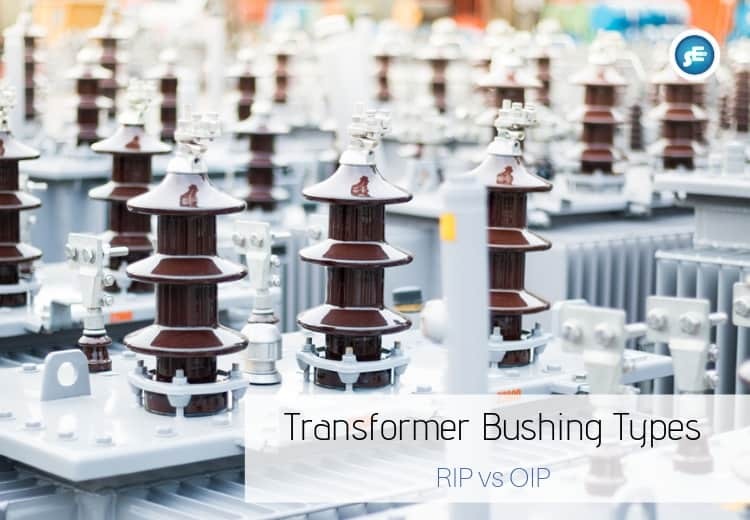 In turn, a greater vulnerability in an OIP transformer bushing type exists to lightning strikes or other factors that can trigger explosive failure. Additionally, excessive filling of oil reservoirs in horizontal mount applications can lead to severe operational problems. Unusually high operating temperatures on an OIP bushing can comprise its bushing life and again lead to severe operational problems. The figure shows the cross-sectional view of OIP Bushing. In OIP bushing the core is wound from paper and subsequently treated and impregnated with an insulating liquid, generally transformer oil. The core is contained in an insulating envelope (generally “Porcelain”), the space between the core and the insulating envelope being filled with the same insulating liquid as that used for impregnation. Bushings are also provided with Oil level gauge & Test Tap. In the center stem is provided which connects the Overhead conductor to transformer winding, this is usually made of copper. Recently a revolutionary new class of insulating material called resin impregnated paper (RIP) with superior thermal and electrical performance has been developed. The Figure shows the cross-sectional view of RIP Bushing. In resin impregnated paper (RIP) transformer bushing type the major insulation consists of a core wound from paper and subsequently impregnated with epoxy resin. The casting and curing of this insulation is a carefully controlled process. A resin-impregnated paper bushing can be provided with an insulating envelope (generally “Silicone Composite insulator”), in which case the intervening space can be filled with an insulating liquid or another insulating medium like polyurethane foam, gel, etc. Based on the above, it can be said that the major difference between Resin Impregnated Paper (RIP) bushing technology and Oil Impregnated Paper (OIP) bushings is that in OIP technology the condenser cores are impregnated with transformer grade mineral oil that remains in a liquid phase throughout its entire life whereas in RIP bushings the impregnation is carried out via a curable epoxy resin to form a solid condenser. OIP – condenser cores are impregnated with transformer grade mineral oil that remains in a liquid phase throughout its entire life. Now we will compare the two transformer bushing types (Oil-Impregnated vs Resin Impregnated Paper Bushings) based on various factors. Generally observed Partial Discharge level in Resin Impregnated Paper (RIP) bushings are lower compare to Oil Impregnated Paper (OIP) bushings. In Resin Impregnated Paper (RIP), Partial Discharge level generally observed are less than 2 pC. However, in Oil Impregnated Paper (OIP) partial discharge is less than 5 pC. Tan delta values are low for Resin Impregnated Paper (RIP) bushings. The Tan delta value is in the range of 0.35% or lower in the case of Resin Impregnated Paper (RIP) bushings. But in the case of Oil Impregnated Paper (OIP) bushings, the tan delta value is 0.45 % or lower usually. As per IEC standard 60137, insulation class of RIP bushing is Class-E (up to 120 degree C) & in OIP bushing the insulation class is Class-A (upto 105 degree C). Composite RIP bushing weight is approximately 50% of Porcelain OIP Bushing due to this the handling, transportation & installation becomes easier in case of RIP bushings. Also, OIP bushings are more susceptible to damage from vandalism, shipping, handling, and installation. As per IEEE 693-2005, standard RIP transformer bushing type have proven very high seismic performance level. However, OIP bushings have very low seismic performance withstand capability. Also, the mechanical strength of RIP transformer bushing type is very high compared to the moderate strength of OIP transformer bushing type. RIP bushings can be installed Vertical as well as horizontal at any angle. However, in case of OIp bushings, there is a restriction during installation i.e. upto 30o from vertical only. Lowering of transformer oil is required during removal/installation of OIP bushing, the same is not required for RIP bushings. RIP bushings installation time is also very less compare to OIP bushing. Resin Impregnated Paper transformer bushing type requires fewer maintenance checks compare to OIP transformer bushing type due to the absence of oil and porcelain. RIP transformer bushing type are made without any use of insulating oil which makes it non-flammable. This property also makes it a non-explosive type bushing. However, in the case of OIP transformer bushing type, the chances of an explosion are very high due to insulation failure/arcing. The insulation failure or arcing can lead to huge explosion & may also be dangerous due to the outer porcelain envelop which is brittle in nature.